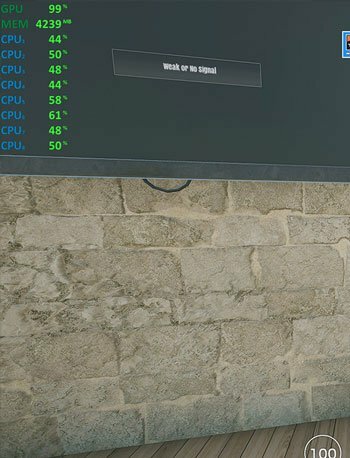 Monitoring your CPU and GPU usage when gaming is something we all want to do from time to time. Whether you’re trying to find a bottleneck, or you’re just curious, knowing how hard your computer is working is never a bad thing. But, how do you get a performance overlay like all of your favorite benchmarkers are using? That’s the real question. 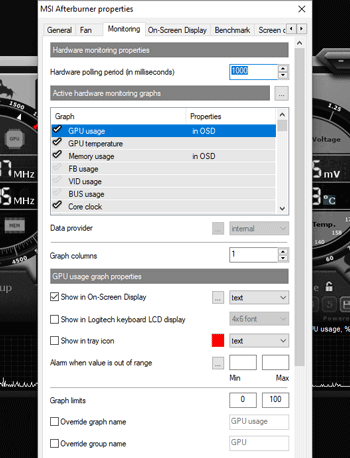 In this post, we’re going to show you one of the easiest ways you can get an On-Screen Display (OSD) to monitor your GPU and CPU usage when gaming. For the purpose of this article, we’re going to be using MSI’s Afterburner and Rivatuner Statistics Server (RTSS). This combination of programs is generally the quickest and easiest way to get an overlay working. Step 1 is downloading MSI Afterburner. 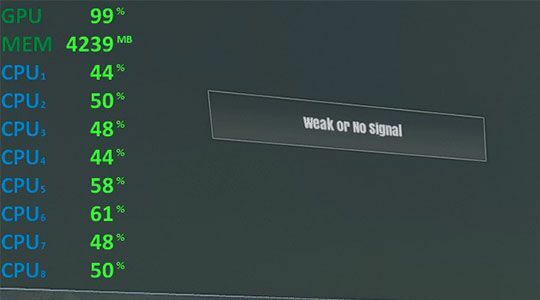 It’s bar-none the best GPU tuning utility you could use and just so happens to come packaged with Rivatuner Statistics Server (RTSS) which we’ll need for the OSD. Not only can you use Afterburner for the OSD, but you can also use it to change things like your GPU clocks and GPU fan speeds – but those are topics for another article. Once you’ve downloaded Afterburner, you’ll want to run the installer – obviously, right? 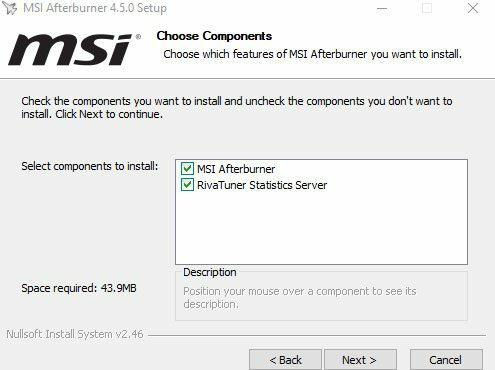 When you’re installing Afterburner, you’ll get to a page that prompts you to “Choose Components”, make sure both MSI Afterburner and Rivatuner Statistics Server are checked before moving on. Once the install is done, run both MSI Afterburner and RTSS. Make sure you turn off any other GPU tuning utility you might be running while Afterburner is on. Step 2 is configuring Afterburner’s OSD settings. First, you’ll want to open Afterburner and click the Settings icon (the little cog below Fan Speed (%)). In the Settings window, navigate to Monitoring – it’s the 3rd option in the top tabs. Once you’re in Monitoring, you’ll notice a ton of various settings and options. The section we’re most interested in on this page is “Active hardware monitoring graphs”. That’s where you’ll enable (or disable) the statistics you want to be displayed in your OSD. Don’t worry about changing any other settings, the defaults are usually good enough. Unfortunately, you’ll have to manually add all of the stats you want one at a time by clicking on one, looking to the “Memory usage graph properties” section, and then checking “Show in On-Screen Display”. Rinse and repeat until you’ve added (or removed) everything you want. The stats will appear on your OSD in the same order they’re listed in Afterburner, to rearrange them simply drag and drop. Once you’ve added everything you need, navigate to “On-Screen Display” (top tabs again, 4th option) and set up a custom hotkey for the “Toggle On-Screen Display” option. Step 3 is setting up Rivatuner Statistics Server. This part is pretty simple as there’s not much that’s required. All you really have to do is make sure “Show On-Screen Display” and “On-Screen Display Support” are both set to On – they should be by default. Beyond that, you can customize how your OSD is displayed within RTSS. You can change things like overall zoom, colors, which corner it shows up in, and even the font. You can also set up custom profiles per application if you really wanted to. As long as the 2 settings I mentioned previously are set to “On”, there’s nothing you have to change in RTSS for your OSD to work. Once your settings are how you want, feel free to minimize RTSS. Step 4 is starting a game and testing your On-Screen Display. Both RTSS and Afterburner must be running for your OSD to function. Most settings that we’ve gone over can be changed while a game is running, so if something isn’t exactly right you can likely make changes on the fly. Assuming your OSD shows up correctly, you’re done! 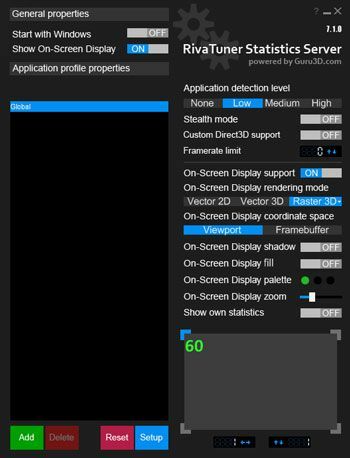 You’ve successfully set up your own On-Screen Display and now you can effectively monitor your GPU and CPU usage in games. Monitoring your hardware usage is never a bad thing to do, it can help you find bottlenecks or it could help you to better optimize your overclocks. With any luck, this article was able to instruct you on setting up your own customized performance overlay so you can do just that. It could be any easier! Those 4 steps are going to work for practically anyone on pretty much any system. Have a question? Ask in the comment section below!